Nylon slings are very versatile, they don’t mar the load, and are inexpensive. They are easy to adjust and can properly lift awkwardly shaped loads. However; nylon slings wear quickly and need to be replaced more often than other types of slings. 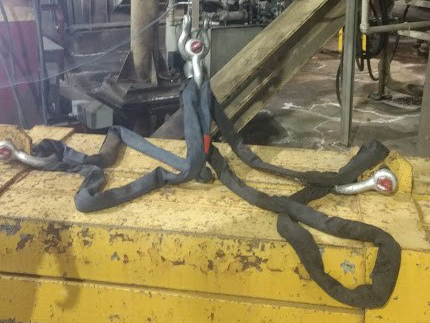 Chain slings can be used to extend a lift’s reach, to lift the load, or added to other slings. While heavy, chain slings offer the best strength, durability, and flexibility. Wire rope slings are often used when a long sling angle is required as they are strong yet light-weight making them easier to handle. Wire rope slings have limited flexibility and care must be taken to avoid kinking the wire rope. Wire mesh slings are widely used in metalworking environments. Adapting to the load shape they are ideal for bundles of steel or for oddly shaped metal applications. Due to their construction, they wear well when handling abrasive product. Only qualified personnel should ever use lifting equipment. Contact Acculift to arrange operator training for your facility. Special thanks to Saturn Industries for the use of the slings used in this video. Want to see lifting solutions in action? We can show you!